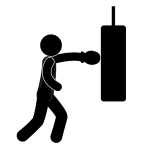 While there are great anecdotal reports and TV stories about boxing programs for Parkinson’s Disease,particularly Rock Steady Boxing, I thought it would be interesting to learn whether or not these results have been quantitatively measured. Stephanie Combs-Miller, a professor at the University of Indianapolis Krannert School of Physical Therapy and director of research for the University’s College of Health Sciences, has been studying the effectiveness of boxing programs for Parkinson’s Disease for 9 years. The outcome measures were the Functional Reach Test, Berg Balance Scale, Activities-specific Balance Confidence Scale, Timed “Up & Go” Test, Six-Minute Walk Test, gait speed, cadence, stride length, step width, activities of daily living and motor examination subscales of the Unified Parkinson Disease Rating Scale, and Parkinson Disease Quality of Life Scale. All 6 patients in this case series showed improvements on at least 5 of the 12 outcome measures over the baseline at the 12-week test. Except for patient 6, all patients showed improvements in every outcome category, including balance, gait, disability, and quality of life. Neil Sligar’s story is worth checking out. Diagnosed with Parkinson’s in 1998, he began a vigorous exercise program in 2000. He wrote about his experience after 10+ years. There are at least 3 articles and 2 interviews worth viewing. Setting small targets has been critical to my improved performances. Focus on tiny gains in the near future rather than big goals in the long term. You can surprise yourself how far you reach. I’ve been working hard to regain the strength in my right arm that Parkinson’s took away from me. I’m making progress. Weight training is a key ingredient in these efforts. It is important to stress that vigorous exercise is not all about cardio, in fact, weight training is a key component. More specifically, I’m referring to weight training as a progressive resistance exercise. This is a strength training method in which the load is gradually increased to allow muscles to adapt. The body adapts to exercise and needs to be constantly challenged in order to continue to grow and change. Essentially, this is the same basic concept we talk about with vigorous exercise, always pushing your limits. As time progresses, you’re increasing the weight, increasing the number of repetitions between rests, increasing the number of sets, and/or adding additional exercises to target complimentary muscles. Without a doubt, PD (and aging in general) makes this harder to achieve. But every small increase confirms that you’re getting stronger. And over time, those small increases can add up to something significant. 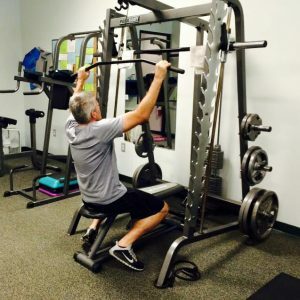 Author Brett WarthenPosted on May 4, 2016 February 7, 2019 Categories Blog, ExerciseTags Exercise, Vigorous ExerciseLeave a comment on Does vigorous exercise have a neuroprotective effect in Parkinson’s Disease?